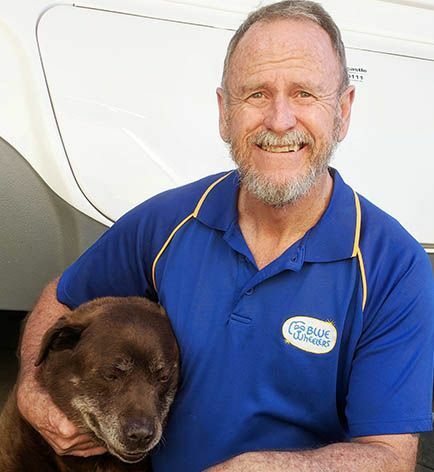 Meet the folks behind the success of Australia’s No.1 mobile dog grooming and washing service provider! "My entire business life has been dedicated to franchising and seeing the joy that comes from franchisees achieving their goals." For over 25 years Martin has been involved in the franchise industry. He spent fifteen years as the Victorian Franchisor for New Zealand Natural, an international ice cream parlour chain. During that time he was responsible for the development of Victorian stores, and was also actively involved in the development of the franchise and retail concept. After selling that business, he consulted to a number of retail and franchise businesses until buying Blue Wheelers. 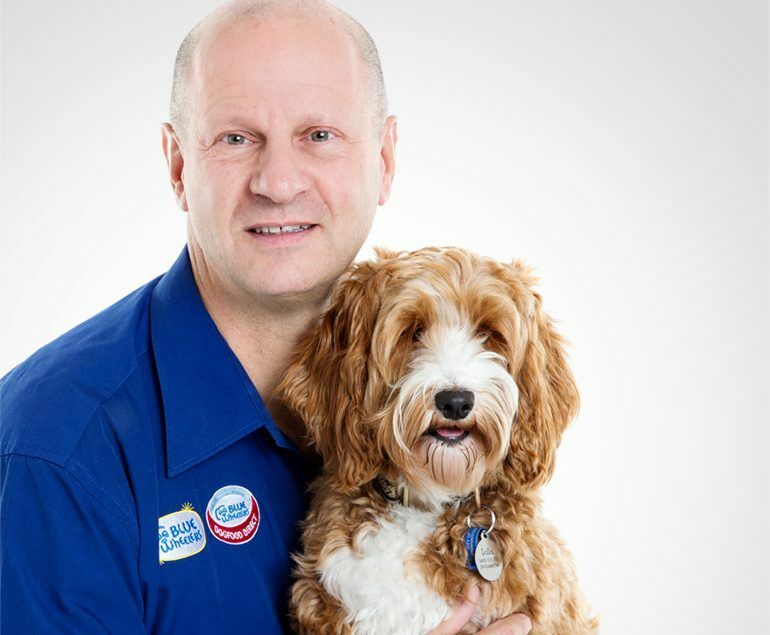 Martin’s vision for Blue Wheelers is to see it continue as the leader in the Mobile Dog Grooming industry; and to also ensure ‘best practices’ in Franchising. Martin prides himself on his commitment to driving Blue Wheelers’ growth while ensuring the continued success of all franchisees. "I love our brand and know the importance of how it’s perceived by our customers. I love seeing all our Blue Wheeler Social Media and reading the great customer feedback our operators receive every day." Janie worked in marketing and corporate relations for Village Roadshow Ltd for a period of 10 years. During this time, Janie was actively involved in all aspects of the company including the marketing of movies; theme parks and cinemas. Previously, Janie worked in the television industry again in the marketing arena. Janie’s role in Blue Wheelers is the governing of the Blue Wheelers Brand and the creation of new marketing materials. Janie services franchisees and master franchisees with all their marketing needs and is also involved with Blue Wheelers’ business development. Kellie has a wealth of experience over her many years in business and the franchising industry, including several GM roles in the past. She has worked with many high-profile companies including Bakers Delight, Curves Fitness, the RFG group and Back in Motion. 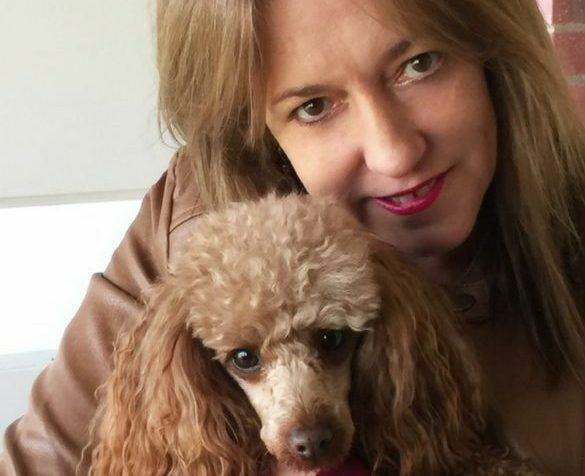 Kellie bring her passion and perspective to Blue Wheelers and is hands on with mentoring franchisees through her own experience and of course a love of dogs. There's no better feeling than changing peoples' lives for the better. Seeing happy franchisees doing something they love. Playing with dogs! 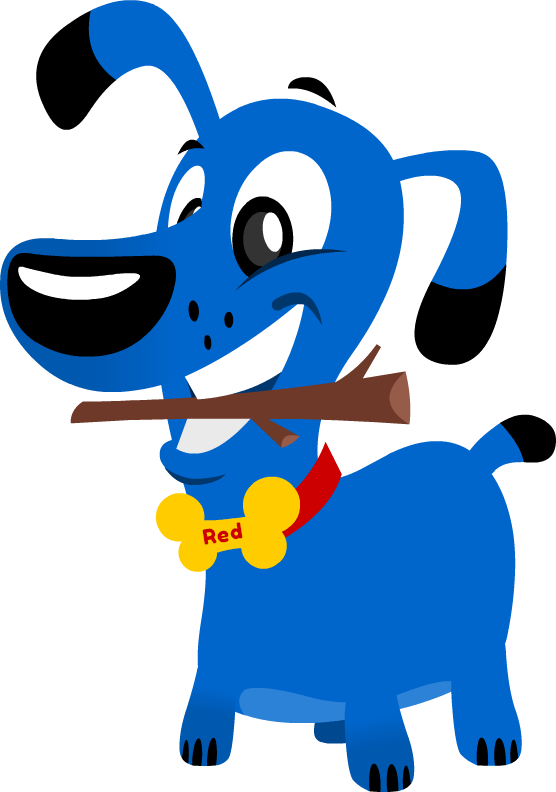 Col decided that his own love for dogs was well worth a life change and bought a Blue Wheelers franchise in 2005. As Col’s passion for dog grooming grew, so did his involvement with Blue Wheelers. In 2009, he became the State Manager for South Australia. Now in a national role, Col continues to grow the Blue Wheelers family. In this role, he ensures that Blue Wheelers stays Australia’s Number 1 Mobile Grooming Service. Starting off as a franchise in Blue Wheelers has given Col the necessary understanding of what new franchisees experience when they first start out, and is well placed to assist them with transitioning into running a successful and professional business. "Even though I am a passionate dog lover I can’t believe how much fun a person can have working with dogs. Every day I work I have a smile on my face – now I’m about to share all of that joy with others." May was managing a financial planning practice when she decided she wanted more of the happiness curve in her life! She was looking for better job satisfaction, less stress and earning potential that reflected her hard work, and she wanted to have fun doing it. 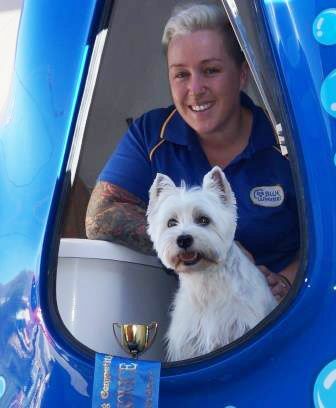 So she became a Blue Wheelers Mobile Dog Groomer over nine years ago. She had flexibility and control over when she wanted to work and when she wanted to take holidays. Now May is excited to be embarking on a new role within Blue Wheelers as National Training and Operations Manager. 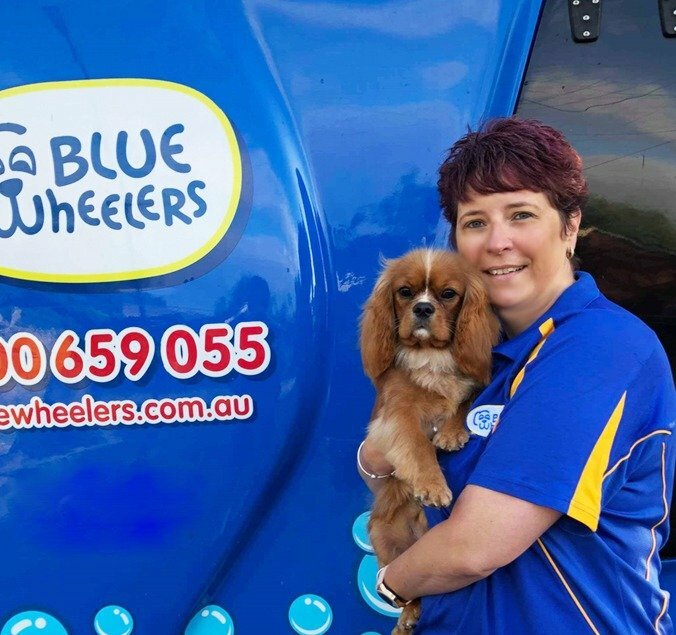 She can’t wait to pass on her years of knowledge and experience to other Blue Wheeler Groomers and assist them in gaining job satisfaction and rewards by following the Blue Wheelers ethos. "I love being able to help new team members build their business, and inspire those who have been around longer. My favourite aspect is being called upon for advice by our team members. If I can’t help I put them onto someone who can or I find out the answer quick smart!" 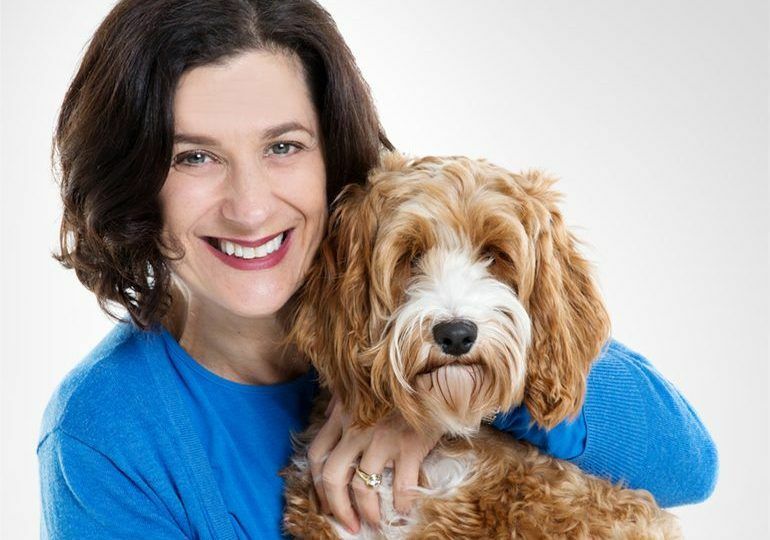 In May 2009 Lesley began her journey with Blue Wheelers, building a new business from scratch. This was quite a change from being in childcare for over 16 years. Lesley built a very loyal client base and was delighted to hand over the reigns to her daughter Asha in 2015, as she stepped up to take on the role of Queensland Support. Asha now runs the successful Blue Wheelers Lawnton business and Mum still gets to see the dogs from time to time. Lesley enjoys getting out and meeting her fellow Blue Wheeler Groomers. She is able to add major value having previously run a Blue Wheeler franchise and can empathise with any concerns or issues that may arise. Lesley is a great motivator and advocate for the Blue Wheelers brand. I enjoy coaching new Franchisees to develop business goals and achieve quality grooming skills. Trevor was working as a Constable in NSW police for several years and then moved to Dubbo to work as Bus lines as Operations manager. Trevor’s always been a serious dog lover so he decided to translate his passion for dogs into a successful profession. Through a chance meeting in Tasmania with Martin mid-2010, Trevor decided to join the Blue Wheelers family in May 2011. 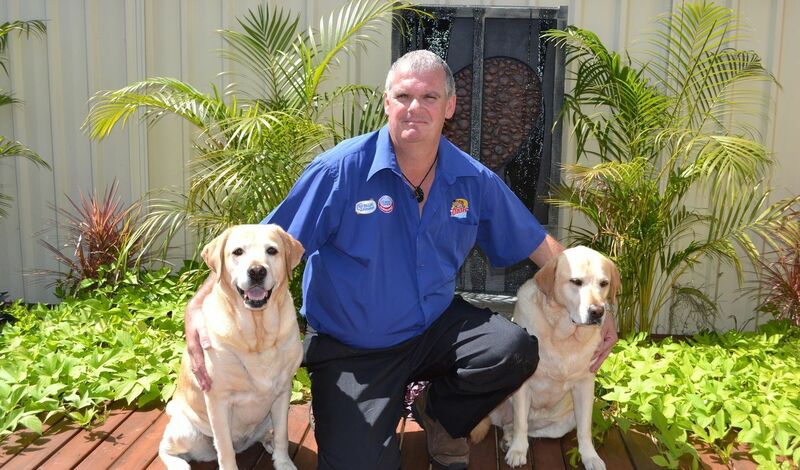 After many happy years as a franchisee, Trevor is now in the position of NSW Team Support. Trevor is assisting his fellow NSW Groomers to grow their business and maintain ‘best practices’ in this State. "I’m truly enjoying getting around and meeting all of our SA team individually. One on one time with everyone is true quality time where we can problem solve, discuss strategies and really talk about the successful direction of their Blue Wheelers business." After spending 8 years as an Environmental Scientist working for the South Australian Government, Rehanna decided to trade in water science for washing dogs! Rehanna loves every one of her Doggie clients as if they were her own (the humans aren’t bad either) and as well as operating her own successful business she now enjoys helping other team members reach their full potential as dog groomers. "If It's Going to Be, It's up to Me…"
Mark worked in transport for 20 years in various roles from forklift operator to senior management. Mark then joined his wife’s Blue Wheelers business in 2012. When his wife, Kristie had to take time off due to an injury Mark became a full time Blue Wheeler. It was all part of a process for him to rediscover himself and invest in in his family. Mark enjoys operating a thriving business while still having time for his family. Mark’s aim is to continually grow and learn and to help fellow WA Blue Wheeler team members achieve the same. He knows that staying still in business is to go backwards. Dave spent 22 years in the Royal Australian Navy in a variety of roles. He then worked in a private school in a support and pastoral care role. Dave first joined Blue Wheelers as a franchisee in 2007. 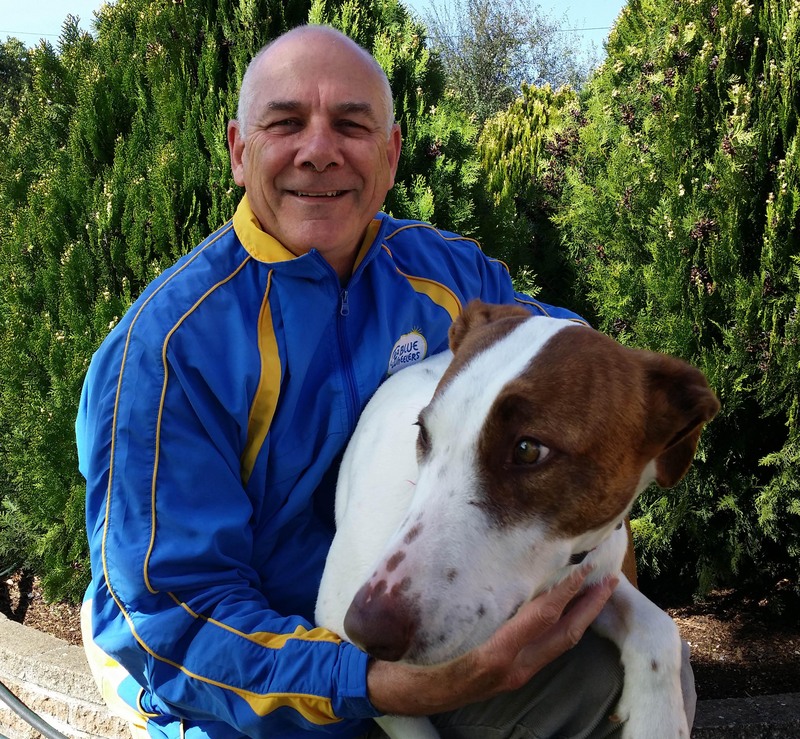 Since that time his passion for both dogs and Blue Wheelers has enabled Dave to be a facilitator in Blue Wheelers National Training. 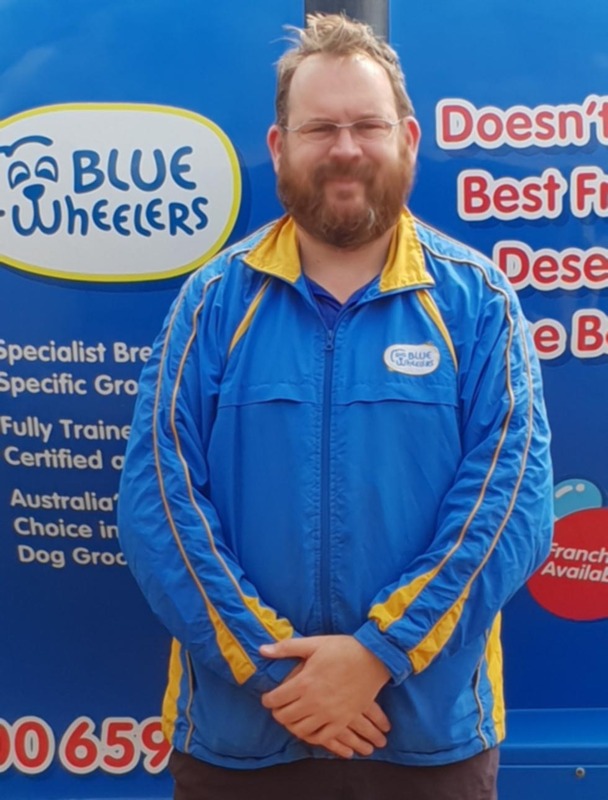 Dave previously headed up the Blue Wheelers Training school and enjoys all aspects of getting a new franchisee trained up and ready to hit the road. His current role is training and supporting new franchisees in their MATE system, our much loved and widely used CRM technology. Dave is completely passionate about Blue Wheelers and believes that anyone can change their life for the better through the Blue Wheelers system. 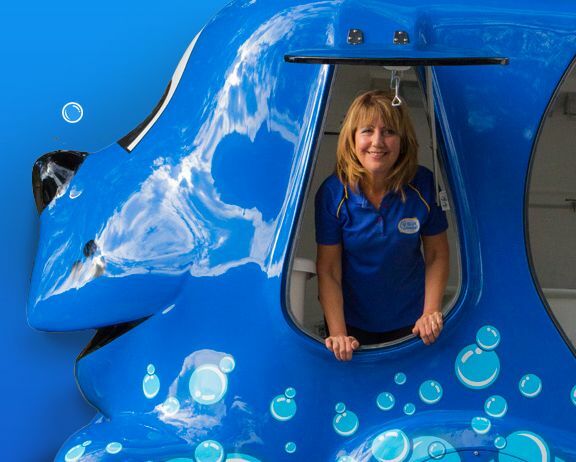 "I love ‘joining all the dots’ through the process of franchisees joining the Blue Wheelers family, it is such an exciting time for them and it rubs off on me too." Natalie manages our office and sometimes the people in it! Natalie is also Blue Wheelers’ bookkeeper and provides support for new and existing franchisees. Natalie has come from a strong background in customer service and bookkeeping. Having established and run her own business as a bookkeeper and BAS agent she understands small business and the challenges that owners face. Moving back to employment was a big decision that she didn’t take lightly and it was the diversity of the role at Blue Wheelers that won her over. Currently an apartment dweller, Natalie doesn’t own a dog at the moment, so she frequently visits her best friend, and her dog, “Teddy Bear” (pictured), for a puppy fix! "My passion is to keep listening to our customers so I can make sure that we're doing exactly what we should be doing every day. This keeps our customers and their fur babies coming back again and again for their Blue Wheelers experience." 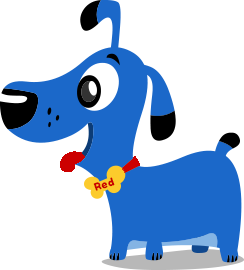 Ran’s role here at Blue Wheelers is the Marketing Assistant, and it’s a busy one! She fills all Blue Wheelers orders for products, works on marketing and website updates, runs Facebook campaigns and assists with office admin work every now and then. Ran graduated from Deakin University with a degree majoring in Marketing and Management. Graphic Design, Marketing and Social Media has been a strong interest of hers due to Ran being a self-declared “right brainer”. Ran is also the Blue Wheelers resident blogger and loves writing about dog grooming – she can go on for days about dogs! In her free time, Ran can be found watching funny dog videos, writing about dogs and doodling pictures of dogs. Lulu is Blue Wheeler’s unofficial mascot! 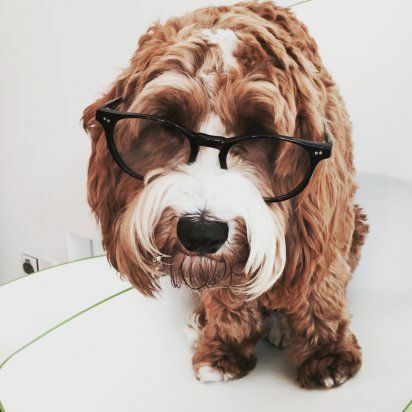 She is a feisty labradoodle who often pops into the office to ensure all is running as it should be. She runs around, sniffs out any issues and goes home with Janie and Martin every day!